CHICAGO—Once home to a collection of freelancers and start-ups, co-working has now also begun to attract Fortune 500 firms that want to establish satellite spaces. 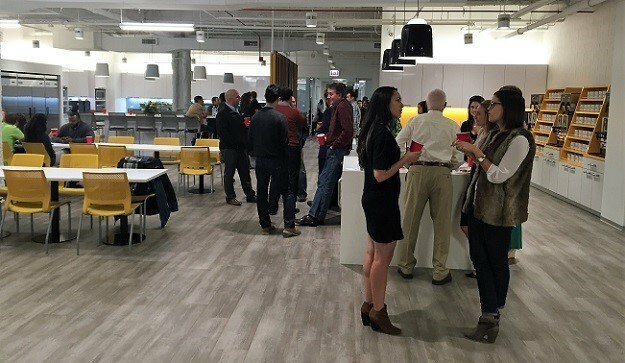 Washington, DC-based MakeOffices recently opened its first Chicago site in River North. CHICAGO—Co-working may have begun with collections of freelancers joining together to share cheap office spaces, but it has rapidly become a big business that has helped transform the downtown office market. In fact, three of the largest 2015 office leases in Chicago were signed by industry leader WeWork, according to the latest market beat report from MBRE. Furthermore, three of the largest leases signed in the first two months of 2016 were also for co-working spaces, another by WeWork and two by a company new to Chicago, MakeOffices. In 2015, Chicago co-working operators took over 304,114 square feet of space in the CBD. And in the first two months of 2016 there has already been at least 187,649 square feet of space leased for co-working in the CBD. These big numbers illustrate that the demand for co-working has gone far beyond freelancers and small startups. Pioneers such as WeWork have begun catering to large corporations, and long-established providers of conventional executive suites such as Regus have responded by adapting their models to appeal to the new group of users. Location and new amenities are cited as reasons why tenants recently leased and expanded at the Marx Realty Midtown property.